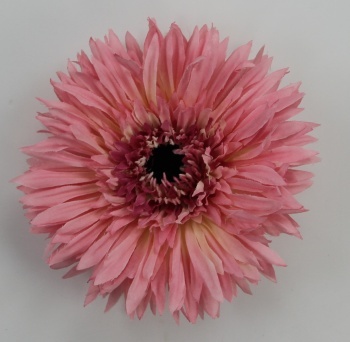 This flower is a 4.5" Pink Silk Spiky Daisy that is already attached to an alligator clip. The clip is lined with a pink grosgrain 3/8" ribbon so it is softer for the head and it is engraved as a genuine Lexa Lou clip. The Flower head is approx. 4.5" across, the daisy spikes make this almost a 5" circumference. The center flower piece is 15 mm and made of brown velvet. It goes from a dark pink out to a lighter pink for the spiky edges.